AV over IP and I/O flexibility. By definition, IP switch (aka Ethernet switch) offers bi-directional data streaming on each of its RJ45 ports. Each port can be a transmitter or a receiver of data at any time. That is quite a big departure compared with traditional HDMI or HDBaseT AV switchers. In a traditional AV switch number of inputs and outputs and direction of the data flow is always fixed. These configurations are usually a factor of 2: 2x2, 4x4, 8x4, 8x8, 16x16, 24x24 and etc. Once such a switch is installed this configuration and direction of the data flow cannot be changed. The use of each port as transmitter or receiver only controlled by number of video encoder or decoder units connected to the IP switch. This ratio can also be changed at any time after installation by adding or removing encoder or decoder units on any of the ports. By its nature none of the ports are designated transmitters or receivers so any of the encoder and decoder can be added or removed on any of the ports. That is a remarkable flexibility that was never available with a traditional HDMI, DVI, VGA or HDBaseT AV switches. These days, an IP Ethernet switch is a universal data interconnection device providing connectivity for audio, video, all types of data and control. It is a very flexible system that allows connectivity regardless for the data type. In the AV over IP world we take a full advantage of that flexibility. There is nothing to prevent AVoIP encoder to include RS232, IR, USB and audio together with video in the transmission or reception of the data stream. Another remarkable AV over IP feature is that each data type can keep its own origination and destination address controlled only by IP addresses. So while downstream video data packets are flying from the HDMI input of encoder #A to the HDMI output of decoder #B the upstream USB data flow connecting USB input ports of decoder #C to the USB ports of encoder #D. At the same time RS232 data may travel downstream from encoder #E to the RS232 terminals of decoder #F and so on. The control data (RS232, IR) reflects IP switch overall topology and can go any direction between any ports assuming each port has its own IP address. 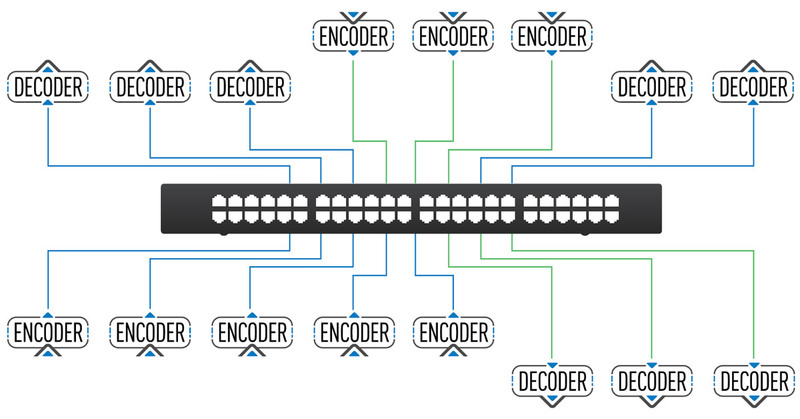 The video and audio data are a bit more rigid and always flow from the encoder to the decoder. 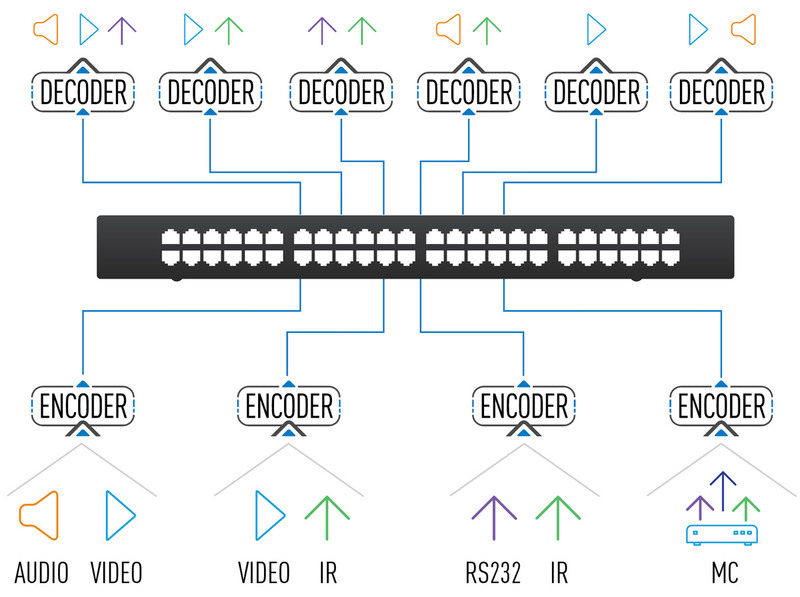 The reason is that more cost effective IC solution forces to have dedicated encoders and decoders IC's for video and audio compression and decompression. However, in the AV over IP world that is not a limitation because video and audio equipment is always divided to sources and displays. Source always requires an encoder while display always requires a decoder. 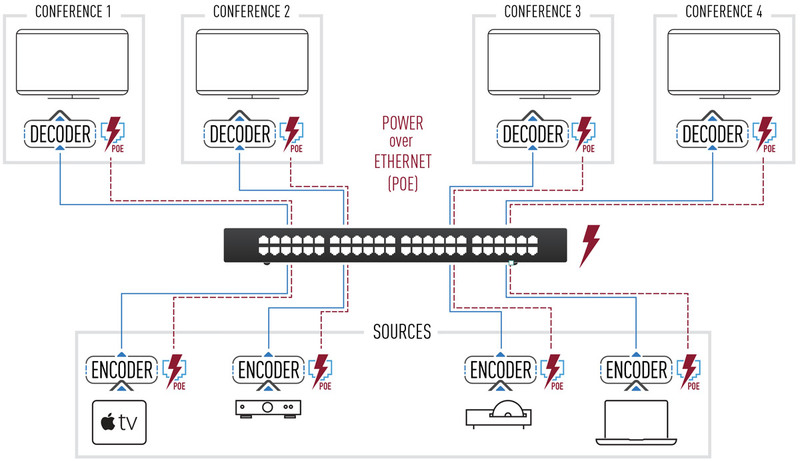 AV over IP being a fully standard IP interconnection technology can take a full advantage of power over Ethernet (PoE). Standard PoE is 48V technology with a lot of commoditized technology available on all levels of the products manufacturing: modules, IC, IP switchers, Injectors, separators and etc. The AV over IP encoder or decoder average power consumption is ~10W. So, 48 port IP switch has to be able to supply at least 480W of PoE power. That is especially handy for the decoder unit that are usually located between TV monitor and the wall and have a limited access to the power. Sometimes encoders are also mounted inside the conference room and can also benefit from the access to PoE switch. This was never available in pure HDMI system and now increasingly popular in HDBaseT. 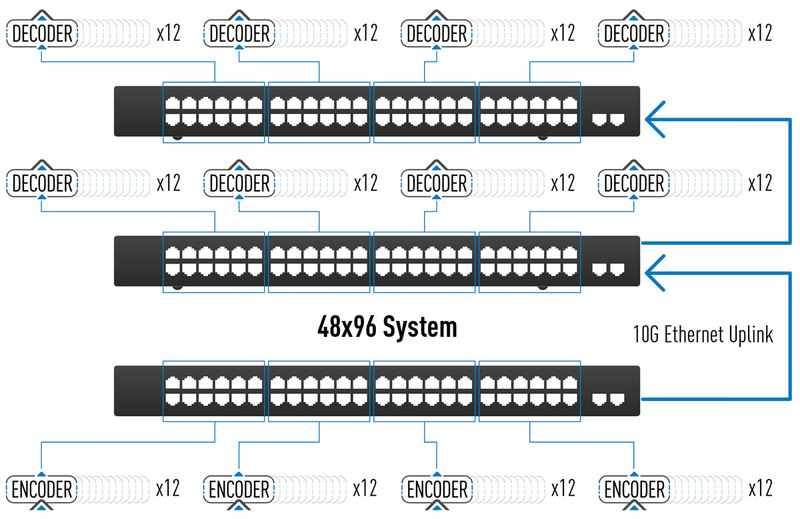 All video encoders are connected to switch B and all video decoders are connected to switch A. Naturally all data flow between switchers in this example goes form switch B to switch A. If all video sources are 4K Ultra-HD and compression system used is a variant of JPEG2000 the Data Flow rate should be comfortably 900Mbps x 48 = 43.2 Gbps. AV over IP system will follow all generic IT/IP cable recommendations. Usually they are not to exceed 330 feet from source or sink to the switch and from the switch. That is comparable with state of the art HDBaseT cable length capabilities. If longer than 330 feet is needed, there are a few standard IT technologies available: fiber or coaxial. The length can be also doubled by utilizing IP switch as a repeater between encoder and decoder effectively doubling connection length to 660 feet for twisted pair cable. View a selection of AV over IP products.